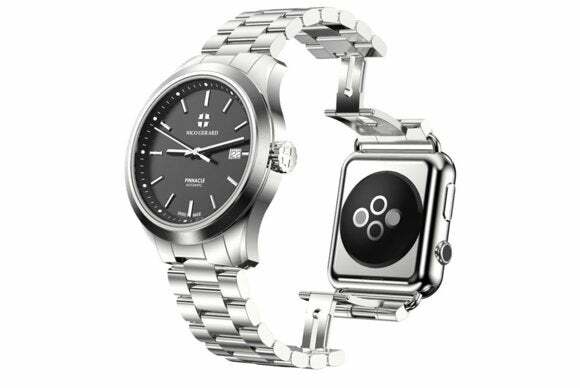 The worst Apple Watch accessory? Another watch. I’m reviewing the Pebble Time right now, but I’ve kept wearing my Apple Watch, and let me tell you: I feel pretty silly wearing two of these things. But that’s nowhere near the pinnacle of silliness: the Pinnacle, a line of luxury Swiss-made wristwatches with an Apple Watch on the other side. Announced Monday by California watchmaker Nico Gerard, and available for preorder, the Pinnacle watches feature a normal-looking fancy watch on one side, which you wear facing out on your wrist. It’s got a 41mm case and a date indicator, and it’s water resistant to 100 meters, but you can’t really take it that deep, because the other side, where the clasp would normally go, is an Apple Watch, which is only water resistant to 30 meters. It’s two watches in one! Yes, that means you have a regular watch facing out, the Apple Watch facing in, and the “papillon” dual butterfly clasps have been relocated to just above and below the Apple Watch. So I guess this is for people who really like watches, but don’t want to look like they’re wearing an Apple Watch all the time? And people who don’t type much, since it seems like it’d be uncomfortable to rest your wrist on anything with a second watch face clunking around down there. Oh, and it’s also for people with money: the Pinnacle line will come in stainless steel with a black face and 38mm stainless steel Apple Watch for $9,300, and that’s got a 10- to 12-month delivery window, so there’s a chance another Apple Watch will come out before your preorder is fulfilled. You can upgrade to a blue face on the Swiss half for $200 more, and shorten that delivery window to 8 to 10 months. But if you really can’t wait, go for the gold: an 18-karat gold option with a red dial will set you back $112,000, but it also comes with a gold Apple Watch Edition, and you’ll only have to wait 6 to 8 weeks. The Pinnacle is officially the craziest Apple Watch variation we’ve seen yet—and that’s saying quite a lot.